Deciding on a bug tracking tool to use for the development of your app can be confusing. The sheer amount of tools that have surfaced in the recent years and the similar functionalities they offer can make it difficult to determine which one will be best for you and your team. Bug trackers are essentially task management tools that offer a wider range of functionality than bug reporting; there are very few trackers that support only bug reporting functions. This makes it important to consider whether you will incorporate the tool into your development process as a project management tool or restrict it to bug reports. You also need to consider how well the tool will integrate with any other products you might be using to make sure the process is streamlined. Perhaps the biggest deciding factor affecting your choice of a tracker will be the size and distribution of your team. Larger and more distributed teams require more powerful solutions that can handle a high volume of issues and make team communication and collaboration easier. Let’s take a look at some of the most popular tools available and their suitability for different types of teams. 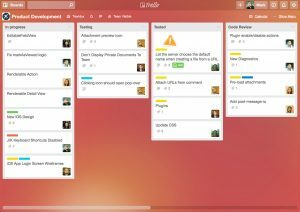 Trello is an exceedingly popular kanban-board based project management tool boasting one of the simplest, most intuitive interfaces around. With its boards, lists, and cards system, new users are able to get the hang of Trello almost instantly, making it possibly the quickest learning curve of currently available tools. Trello is web-based, offers extensive integrations, and cards are edited in real time, making it very easy for distributed teams to view the progress of their tasks and discuss them. For bug reporting, lists can be used to represent the status of the bug, while cards, representing individual bugs, can be moved between those lists according to their progress. Team members can be assigned to bugs via adding them to the corresponding card and alerts can be set to notify them of any changes made to the card. This approach works well for small to medium teams that don’t have to deal with a large volume of bugs, but due to the visual nature of Trello, becomes inefficient when the board starts to get overcrowded with cards leading to poor visibility of bugs and their progress. When bug reports are submitted by non-technical users, the lack of structure to the reports in Trello can result in lower quality reports since there are no templates to guide the reporter. However, this can be easily overcome through the use of an in-app bug reporting tool that offers standardized bug reports. 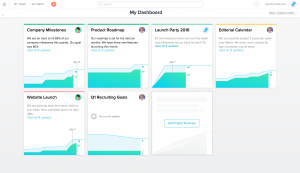 Trello offers a free plan with unlimited users and some limits on functionality, like restricting boards to one integration each, while their business tier costs $9.99 per user per month and unlocks unlimited power-ups. Simple, intuitive interface with a low learning curve. Has a mobile app to get things done on the go. Unlimited users on free plan. Not suitable for teams with a large number of bugs/tasks. No reporting function for bug status, burndown charts, etc. Great for small teams who don’t expect a lot of bug reports but needs to be coupled with a bug reporting tool when end-user reports are expected. Becomes progressively less suitable with increase in team size and/or app complexity. 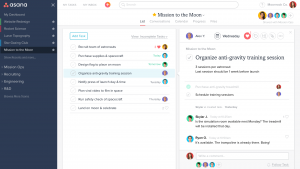 Asana is a web-based project management tool that tries to emphasize communication and collaboration. Teams can organize their work into projects, sections, and tasks, which can be visualized through a kanban board or list view. 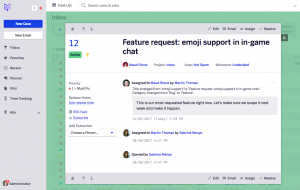 Asana also offers a lot of integrations with the most popular tools, detailed reporting to help track the project’s progress, and advanced search functions, which can be very useful for bug tracking. Although it is not considered difficult to master, confidently navigating through Asana’s features takes a little bit of time initially; overall, the UI is quite intuitive and easy to grasp. Additionally, it can handle bigger teams and bug report volumes, but with limited workflow customization, it does have a limit to the degree of complexity it can manage. 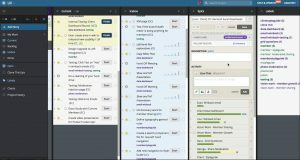 Like Trello, end users might have a hard time submitting quality bug reports due to the lack of structured input. The use of an in-app reporting tool like Instabug can facilitate that process. Asana is free with unlimited projects for up to 15 users but with limited features. To unlock all features like advanced search, progress reports, and task dependencies, Asana charges $9.99 per user per month. Task dependencies, progress reports, and advanced search. Can handle bigger projects and teams. Most useful features for bug tracking are only available on premium. Can be relatively too powerful for the needs of very small teams and simple apps. Ideal for small-to-medium teams developing apps that are not very complex. In-app reporting tools are needed when end-user reports are expected. GitHub Issues is GitHub’s take on issue tracking and is designed to be a simple yet flexible solution. GitHub Issues provides a tool to help with tracking and organizing issues in the same place you are probably hosting your repository. Virtually all developers are familiar with GitHub and this certainly helps the uptake of the tool within your team. GitHub Issues is designed as a project management tool, not a dedicated bug tracker, and doesn’t provide a feature for issue types. Instead, it allows you to create kanban boards called project boards and uses a system of labels to differentiate between the types of issues. You can create labels for issue type, status, etc. and filter your views by issue types. You can also assign up to ten users to each issue and use @mentions to notify them. A very useful feature is the ability to link an issue to the associated pull request. This helps you track which pull requests introduced the bug and makes it easier to fix. GitHub Issues also lets you add milestones to issues you create to help you track what needs to be done for your releases. The tool also provides some useful, but limited reporting functionalities to track the progress of your project and help you gain visibility over it. However, GitHub’s marketplace offers many third-party plug-ins that you can use to extend on its functionality. As with any tool, GitHub Issues does have its limitations. Its labels system is quite flexible but does not scale very well. As the number of bugs and collaborators increase, the number of different labels also increases and it becomes difficult to track them as they progress. Moreover, while GitHub Issues does offer some workflow automation, it has very little to offer in way of customizing these workflows. For personal developer accounts, GitHub costs $7/month. Organizational accounts cost $25/month for the first five users and $9/user/month for every extra user. GitHub’s business and enterprise tiers both cost $21/user/month with the enterprise tier billed annually. Simple yet flexible tracker that can be used in many scenarios. Links bugs to pull requests. Already used by most developers, which helps with its adoption. Does not handle large nubmers of issues well. Reports and insights are limited without the use of plug-ins. GitHub Issues is great for small to medium teams who are dealing with a small to moderate number of bugs. It has many features to support communication and collaboration and enjoys the advantage of familiarity with virtually all developers. Moreover, in case you already use GitHub for hosting your repositories, it essentially comes for free. If you are dealing with a large number of bugs, or require anything more than basic workflow customization, GitHub Issues is not what you are looking for. Bugzilla is one of the first bug tracking tools on the scene and is definitely a pioneer of bug tracking. Developed and maintained by the Mozilla foundation, it is an open source program that was originally developed as an in-house bug tracking tool for the Mozilla project. Bugzilla is a very powerful tool that is designed to be a dedicated bug tracker with features like automatic duplicate detection, advanced search options, highly customizable workflows, and other features to aid with large-scale bug tracking needs. Albeit not too sophisticated, a number of plug-ins are available to add kanban boards and a number of other customizations. Bugzilla might be free and feature-rich, but that comes with a price. It has a relatively steep learning curve, can be confusing for non-technical users, and does not offer a hosting service. You’ll have to go for on-premise hosting or a third-party hosting service and the same goes for support. If yours is a small team or project, you will probably find Bugzilla to be not suitable for your needs, especially with its outdated and clunky interface. Bugzilla is free to use, but if you require cloud hosting or support, you will need to solicit third-party services. 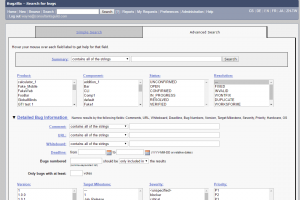 Advanced search and automatic duplicate detection. Actively maintained and updated by Mozilla foundation. Third-party services required for cloud hosting and support. Outdated user interface and steep learning curve. Bugzilla is one of the most powerful bug tracking tools available, but being originally developed for open source projects, it is more suitable for projects with many collaborators and/or bug reports. Moreover, the need for on-premise hosting can be an obstacle for the tool’s adoption within small teams and indie developers considering that they will find little benefit from its advanced functionalities. Being only two years younger than Bugzilla, FogBugz has a long track record in the realm of bug tracking. Developed by Fog Creek Software (the same people who brought Stack Overflow and Trello to the world), it started out as a dedicated bug tracking tool and later went on to add a wiki module for documentation and a support help desk. Very recently, they overhauled their tool to tackle “ethical bugs” with a new name, integrations, design, and features, but it is still too soon to pass any judgement on those. According to its developers, Manuscript is designed for software development, which is why they focused on making reporting a bug or issue as easy and painless as possible for developers, allowing them to enter a bug with minimal effort and required fields. 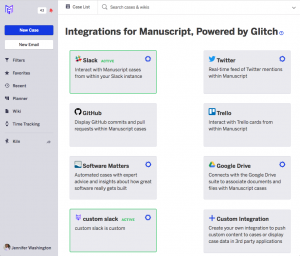 Manuscript also integrates well with many popular tools like Slack and Trello; if you don’t find integration with some of your tools, you can use Fog Creek’s Glitch app to “remix” your own. Moreover, it includes features to support agile practices like scrum and kanban, albeit not as sophisticated as other tools aimed at agile project management. Some of the biggest pain points people encountered when using FogBugz were the absence of custom fields and advanced workflow customization (available through plug-ins). Manuscript addressed these issues by adding the custom fields feature and enabling extensive workflow customization for enterprise users. Being available as a cloud-hosted service and an on-premise solution, it is a flexible solution, however, Manuscript’s server only supports Windows and is not available for Linux. Manuscript offers a free subscription for up to two users. For bigger teams, Manuscript offers a 14-day trial, after which they charge $10/user/month. You will have to contact them for the pricing of their on-premise solution. 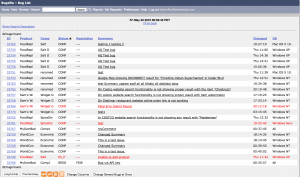 Great search capability and custom reports. Advanced workflow customization on enterprise plan only. Features not directly related to bug tracking are mostly too underdeveloped to be used for more than basic funcionality. Manuscript can be utilized by any team size but is better suited for medium to large teams due to its great bug tracking features, simple default workflows, and easy configuration. However, if you need extensive customization, you will need their enterprise plan. Small teams will consider Manuscript too feature-rich for their needs; it is not overly complicated to make it unusable for small teams, but definitely overkill. Pivotal Tracker was built by Pivotal Labs in 2006 to simplify and facilitate the development process for teams using agile methodologies for software development. It is an opinionated project management tool that supports bug tracking as part of the project management process. Pivotal Tracker organizes all tasks into a few “story” types. The story types available are bug, feature, chore, and release and they all use the same mandatory workflow of icebox, backlog, current, and done. There are few required fields for creating a bug report but you can create templates that can be used when creating a new story to save time and provide structure to your reports. Pivotal Tracker’s workflow is simple and highly efficient, especially for agile development, but it is a rigid one. It works great out of the box, but if your workflow does not fit the tool’s opinion, you can’t modify it to fit your needs. Pivotal Tracker offers great visibility on the status of your bugs and project in general through personal workspaces and powerful charts and reports. In “my workspace” each developer is able to see all the stories that are assigned to them in one place, which helps make sure nothing falls through the cracks. The detailed reporting also allows the project manager to keep an eye on the progress and velocity of the project to identify any issues as they occur. Pivotal Tracker is very software development-oriented and is often praised by developers for helping them become more productive. On the other hand, this can also be a drawback when non-technical users are expected to utilize the same workflows used by developers, which can often be unintuitive for their purpose. Pivotal Tracker is free to use for public, educational, or non-profit projects. Teams of up to three users can also use Pivotal Tracker for free with two projects and 2GB of storage. The startup plan costs $12.50/month for five users, five projects and 5GB of storage and $29.17/month for 10 users, 10 projects and 10GB, paid annually. The Pro plan offers priority support, unlimited projects, and unlimited storage at $62.50/month for 15 users, $125/month for 25 users, and $250/month for 50 users, paid annually. For Pivotal’s enterprise tier, you’ll have to get in contact with Pivotal Tracker’s team. Simple, flexible workflow that works well out of the box. Powerful reports and charts that enhance visibility on the project. Rigid workflow that can’t be customized. Involves a moderate learning curve until you become familiar with its way of doing things. Pivotal is a great tool for any team size as long as their chosen workflows match Pivotal’s opinion on what they should be. It is a good choice if you are looking for a tool with a simple workflow that works right out of the box. Although it might be a bit too powerful for very small teams, it is not too complicated to get in the way of their work, and with being free for up to three users, it can be a tempting choice. 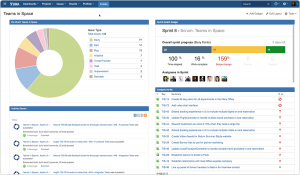 One of the most successful tools for bug tracking and project management alike, Jira was released by Atlassian in 2004 and is now almost ubiquitous in many diverse industries. The name “Jira” is a contraction of “Gojira”, the Japanese pronunciation of Godzilla; this is a reference to Bugzilla, which Jira started out as a more usable alternative for. Jira’s ubiquity is in direct proportion to its powerful features and functionality; it offers, to name a few, sophisticated agile project management features like Scrum and Kanban boards, powerful issue and task tracking with time tracking and estimation, dedicated Jira Query Language (JQL) for advanced search, advanced reporting, and custom dashboards, and vast integration and robust APIs. Moreover, the Atlassian marketplace provides a lot of third-party plugins that add various features like duplicate bug detection. With all these features and more, Jira is a beast of a tool and can handle endless scenarios. The biggest downside to owning a beast is taming the beast! Jira’s many features and endless customization possibilities make it by far one of the steepest learning curves around. Experience with Jira and intimate knowledge of the company’s processes, workflows, and culture are important when you consider customization. Otherwise, you might end up with a tool that complicates your workflow and confuses your team. Another pain point frequently (read always) expressed by users is how heavy Jira is. While this might be expected from such a feature-packed tool, it certainly is too cumbersome for small teams and indie developers, especially considering they don’t need all these features or sophistication. Jira is available as a cloud-hosted service or a self-hosted solution for a one-time license fee. Free for open source projects. $10/user/month for up to 10 users. $7/user/month for up to 100 users. For more than 100 users, use Atlassian’s calculator. 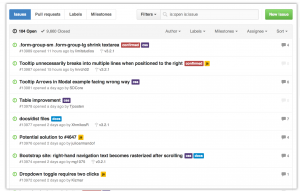 Powerful bug tracker with an advanced search that fully supports agile development. Extensive, deep integrations and APIs. Atlassian marketplace offers 800+ plugins. Steepest learning curve by far. Jira is definitely “overkill” for small teams; unless they have very specific needs for their workflows, choosing Jira for your small team’s needs does not make sense. Jira shines when used by medium to large teams, especially if they require a lot of customization for their processes and workflows. However, Jira requires an experienced admin or some kind of formal training on the tool to unleash the beast within. Learn how Instabug can help you iterate faster, build better apps, and drive five-star reviews through in-app bug reporting.